It is my absolute favorite holiday aroma. Bright and fresh mint combined with the deep, sweet notes of vanilla. Yum! Every year I challenge myself to use this combination in different ways. From scrubs to salves and everything in between, mint and vanilla is my ultimate favorite combination. This holiday season is no exception. I already made this Homemade Peppermint Mocha Coffee Creamer Recipe for my morning coffee. Next, I’ll be planning out my Christmas candies which will definitely include some peppermint and vanilla cutout cookies. Also, this year I’m trying a new Vanilla Jojoba recipe that is just divine! It takes just two ingredients and is so easy to make. This year, I really wanted to make some pretty gifts to give. Since I absolutely love the scent combo of mint and vanilla, I decided to use it in these vanilla mint lotion bars. Because I’m gifting them to people with kids, I decided to use a milder, child-safe mint essential oil: spearmint. It is sweeter and gentler than peppermint essential oil, making it the perfect choice for holiday gifting. You can certainly use peppermint essential oil if that is all you have, just remember to check into the safety considerations of this powerful essential oil before gifting. 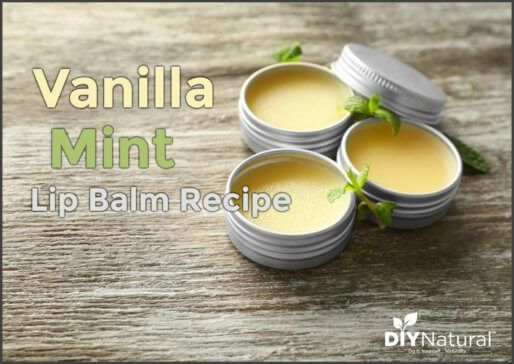 I chose to use vanilla oleoresin for this DIY because of its strong aroma and the fact that it smells just like vanilla extract. Vanilla oleoresin does not always mix completely with oil, but this recipe requires a fair amount of stirring, and I find it does fully incorporate. I really wanted to use all coconut oil for these vanilla mint lotion bars because of its lovely white color, but I find coconut oil alone to be very drying to my skin. I added some high oleic sunflower seed oil for it’s nourishing properties in addition to a small percent of coconut oil. Since the sunflower seed oil made my bar slightly yellow, I decided it needed a little extra oomph in the looks department. I wanted to add glitter, but I have learned how harmful glitter can be to the environment. I went on the search for a blue, biodegradable glitter and found this biodegradable body glitter. It is the best of both worlds: beautiful AND safe for the environment. While it does cost a little more than craft glitter, it is actually a large amount and will last quite some time! Of course, lotion bars need something to keep them hard, namely a wax. I chose beeswax but you can also choose candelilla wax for a vegan substitute. If you leave out the wax, the bar will not be hard enough to remove from molds. 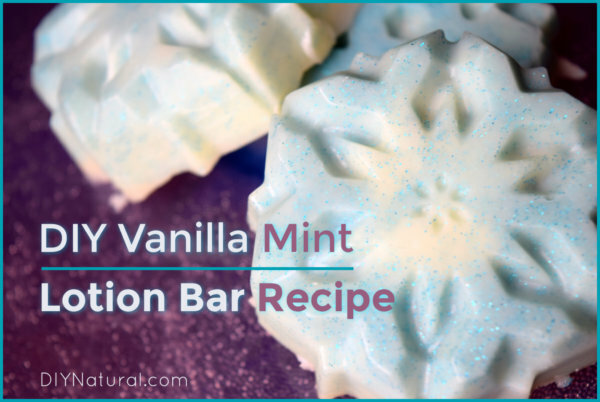 Have you ever made vanilla mint lotion bars? If so, what tips do you have to share? I just read about getting the vanilla cheaper…after I was trying to order more to make another batch. Also, the glitter was too large. I ordered a finer glitter this go round and hope it works out. Finally…what can I sub the beeswax with so I can make for my vegan brother? Thanks for your work! Hi Chris! 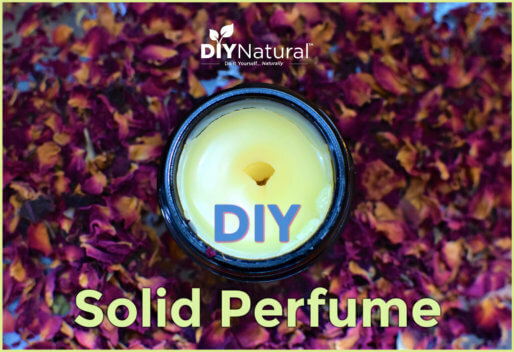 You can substitute candelilla wax for the beeswax to make this vegan. I’d use less candelilla wax (it’s slightly harder than beeswax). I’d try maybe 1 ounce or 0.75 ounces. I have already made special lotion bars for my parents, containing a combination of therapeutic herbs for arthritis. I was hoping to find a different recipe I liked for gifting this Christmas. 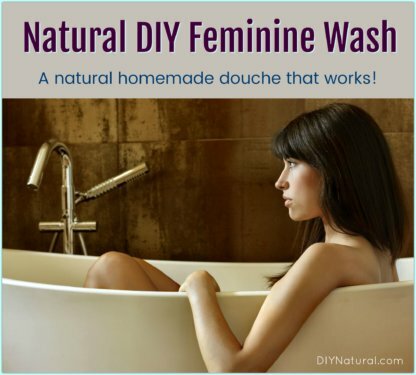 When I was checking out Debra’s liquid soap recipe on this site I was happy to find so much more! I just Love your recipe since I grow many, many mint varieties in my gardens, including spearmint! It’s my favorite too! 🙂 I just Know my son’s girlfriend is going to be so thrilled with this scent combination, so I’m planning to make her an entire bath & body basket filled with Vanilla Mint goodies! Thanks for the brilliant idea and showing me the how to’s and where to find a few of the things I may not already have! I look forward to checking out your blog this winter since there is not a lot more gardening to do! Happy Holidays! Hi Doreen! This recipe makes 3 bars (slightly under 2 ounces each). Mine made the three bars in the pictures. Hey Sherry! You can actually find Vanilla Oleoresin a lot cheaper from Plant Therapy (around $16). I’ll see if we can get the post updated to that link. Thanks, I’ll check this out!